Every month, the Bureau of Labor Statistics releases a news release called ‘The Employment Situation’. Detailing how employment is faring in all industries within the United States. 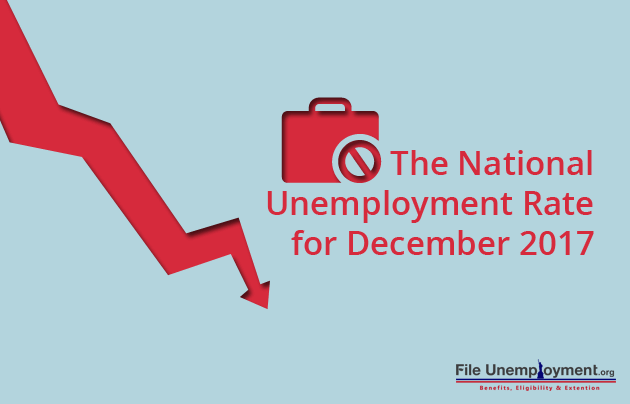 The month of December saw no changes to the overall unemployment rate. However, most of the industries in the United States did create a steady increase of jobs in line with 2016. The national unemployment rate for December 2017, remains at 4.1 percent, the same since October 2017. With the percentile remaining the same the number of unemployed persons remains at the 6.6 million mark. In 2017, the unemployment rate dropped by 0.6 percent, which in terms of people is equivalent to 926,000 respectively. Out of the current crop of unemployed populous, 3.8% of men remain unemployed and 3.7% of women are currently unemployed. Employers in the U.S had added in 148,000 jobs in December in order to ensure that the unemployment rate remains at the constant 4.1%. The unemployment rate has been controlled since October, with a surge in unemployment in months prior. This is actually an improvement as the current unemployment rate is at its lowest since the early 2000’s. Another plus is that December 2017 was the 87th straight month where employers have tried to employ more people. While the current 148,000 jobs created is significantly lower than what the economists predicted for the end of the year, it’s still a good sign knowing that jobs are in creation. The current issue in the United States, however, is that there is a lot of stress on employers, as there are around 6 million jobs still yet to be utilized by the public, but due employers searching for talented personnel only, there is pressure to fill up all those vacant job roles. This is especially important, seeing that the number of long-term unemployed individuals (people who haven’t been able to find employment for 27 weeks or more) changed only little at 1.5 million. This 1.5 million accounted for 22.9 percent of the total unemployed. Throughout 2017, however, the number of individuals who have been unemployed for a long-term declined by 354,000. When it comes to new entrants, the number decreased by a total of 116,000 in the month of December. New entrants consist mostly of the youth population who are looking for employment after graduation from high school or college. Those that have never worked before are also considered freshers seeing as they lack any experience necessary for employment. When it comes to the healthcare industry, employment increased by 31,000 jobs in the month of December. The Healthcare industry tallied up 300,000 jobs in 2017, compared to the gain of 379,000 jobs in 2016. Out of the 31,000 jobs, the healthcare industry created, 15,000 comprised of ambulatory health care services. The remaining 12,000 jobs comprised of hospital staff. Construction jobs increased by 30,000 in December. Most of the increase in number consisted of specialty trade contractors, with an increase of 24,000. Employment in construction increased by 210,000 which is significantly higher compared to the gain of 155,000 in 2016. December also saw employment in the manufacturing industry rose by 25,000, which comprises of a gain in the durable goods industry by 21,000 jobs. 2017 saw manufacturing add 196,000 jobs, which is a slight change from 2016. Employment in food services and drinking places had a little change in December (+25000). Over the year, the food services and drinking places industry added in 249,000 jobs, which is similar to the 276,000 increase in 2016. Professional and Business Services saw a slight change in December with an increase by 19000 jobs. Throughout 2017, the industry had an average of 44,000 jobs per month which is similar to the average monthly gain in 2016. When it comes to retail trade, it seems the situation was unchanged with a decline of 20,000 in December. The retail trade industry saw employment in general merchandise stores on the decline by 27,000 jobs in December alone. Overall retail trade employment has lowered in 2017 by 67,000 jobs after a huge increase in 203,000 jobs in the year 2016. When it comes to opportunities, there are jobs in construction, manufacturing, food and beverages that have constantly produced jobs since 2016.